After a week car camping with Ceri-Siân, we went on to the International Tandem Rally at Elfenmeer Recreatiepark, Herkenbosh, near Roermond in the Limburg region of the Netherlands. 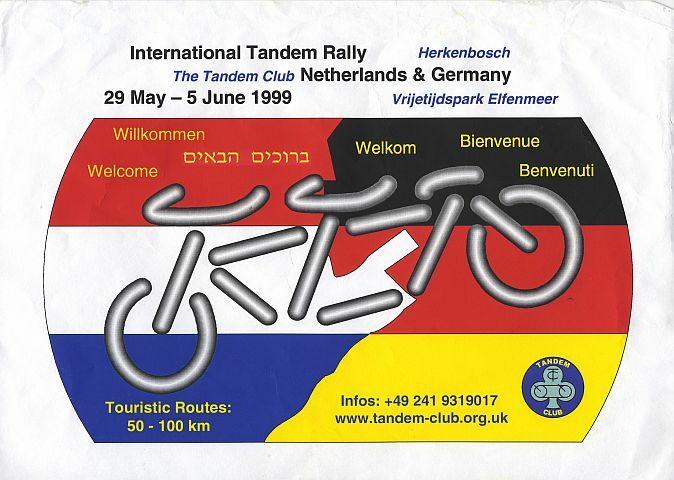 The rally was organised by German members of the tandem club based in Aachen. 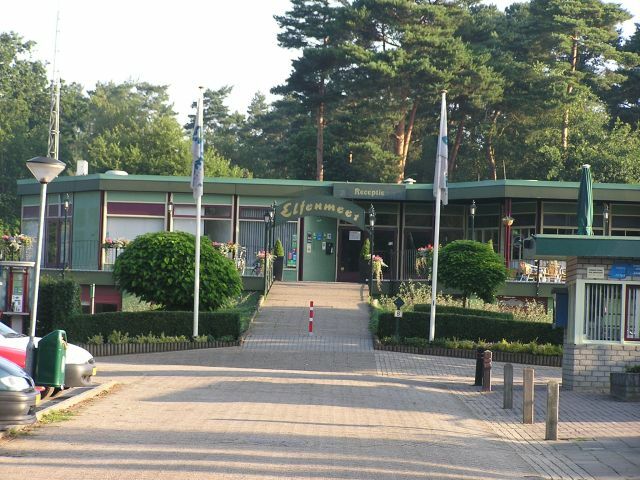 The campsite was a posh site with a swimming pool, restaurant complex and chalets. We shared a chalet with the Carthy family. This is a photo taken we visited in 2004. 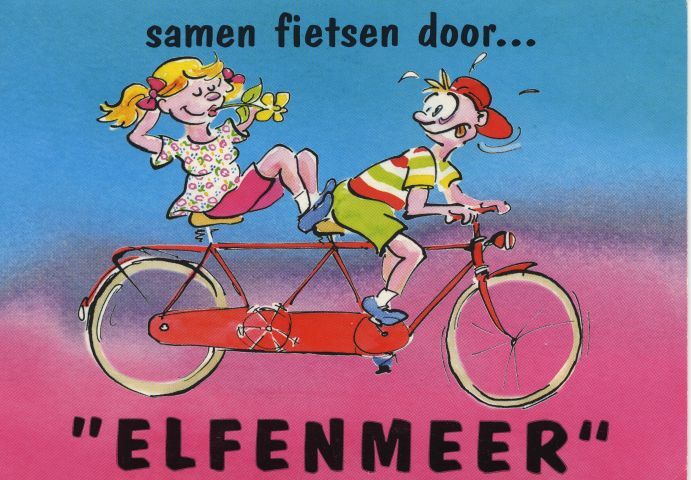 The campsite even had some nice tandem postcards! 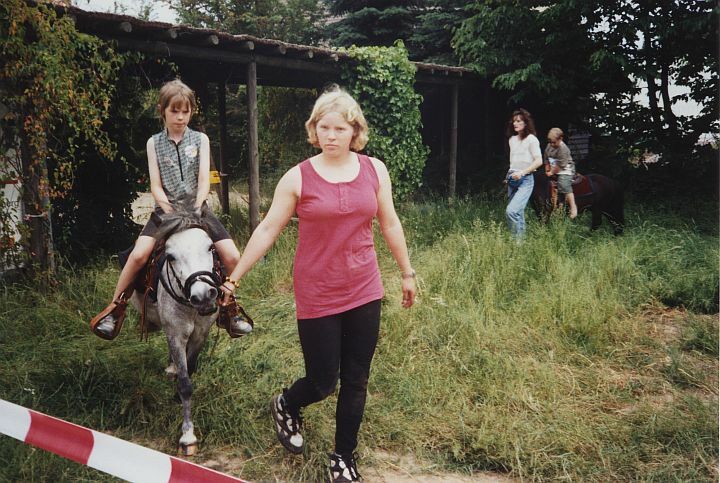 The first ride, Rur-Roer, was into Germany to a Kinder Garden open day in Orsbeck just over the border in Germany. Here is Ceri-Siân having a lift on a pony at the Kinder Garden. 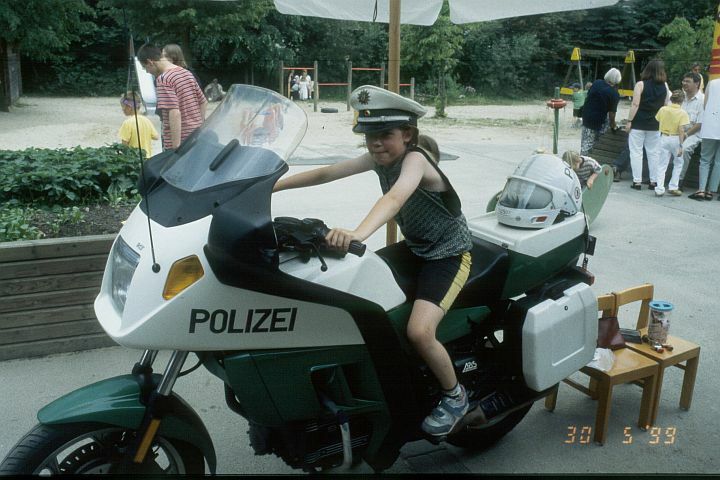 Here is Ceri-Siân trying out a Police motor bike for size at the Kinder Garden. On the Monday the 3 Country ride took the hard riders in to Belgium and Germandy as well as the Netherlands. Ceri and I took the easy option just did the trip in to Belgium and back. 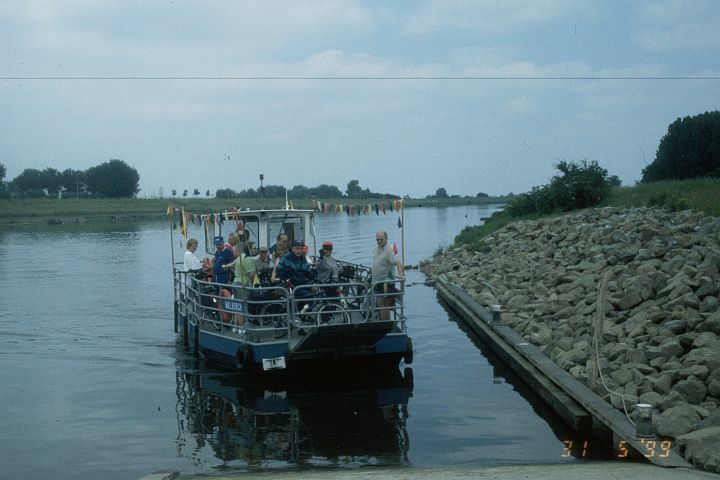 This is the ferry across the border, the R Maas, between Ophoven and Ohé en Laak. The ferryman did a roaring trade that day. 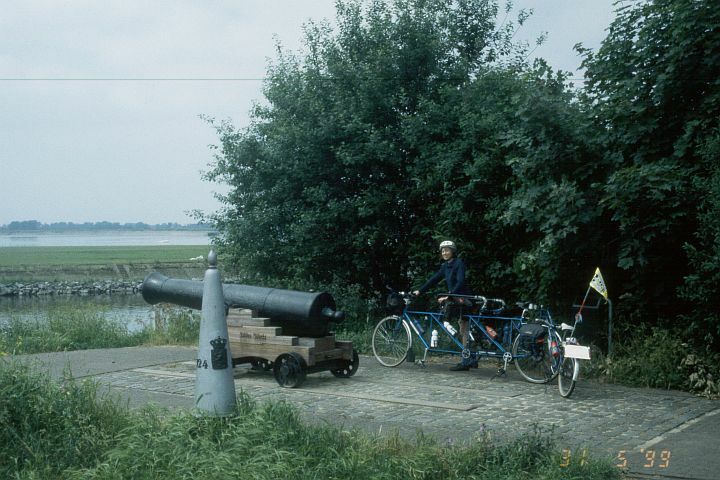 Looking across to Belgium..
Old cannon and 1824 border post at Stevensweert. The triplet is a Flying Gate design. The family from Abertawe, have Dutch relations and they travelled to the rally by train from Hoek van Holland with no problems with the triplet and trailer bike. 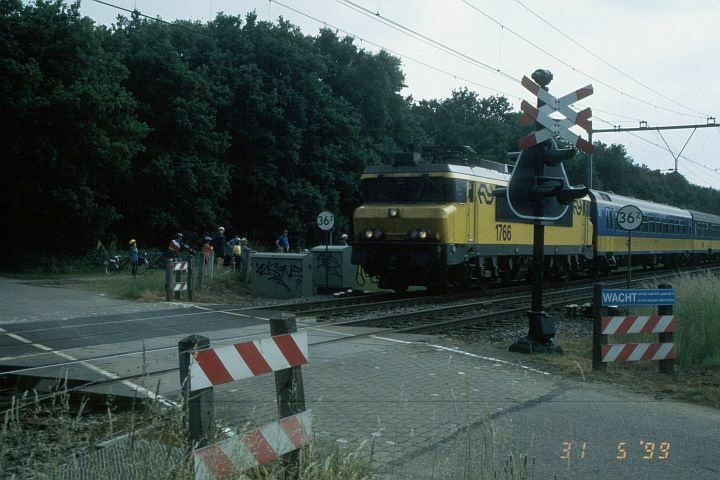 Being flat and with a good railway system, level crossings are frequent giving an excuse for a drum up and grice. As the others in our group wait for me, I am taking a photo of a Maastricht - Amsterdam/Den Haag train. On the Tuesday, Ceri and I did our own ride, riding some tracks into Germany and Back. 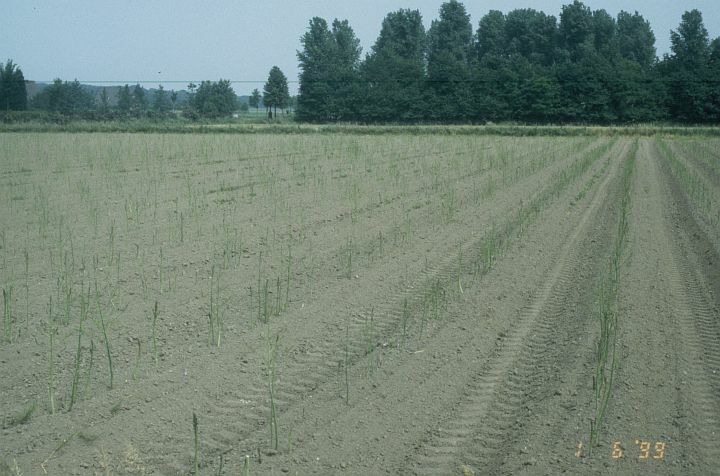 On route we passed a few asparagus fields, the crop that the regions is famous for. Ceri-Siân was worried on our rest day at the International when we went on a train trip from Roermond to Nijmegen. 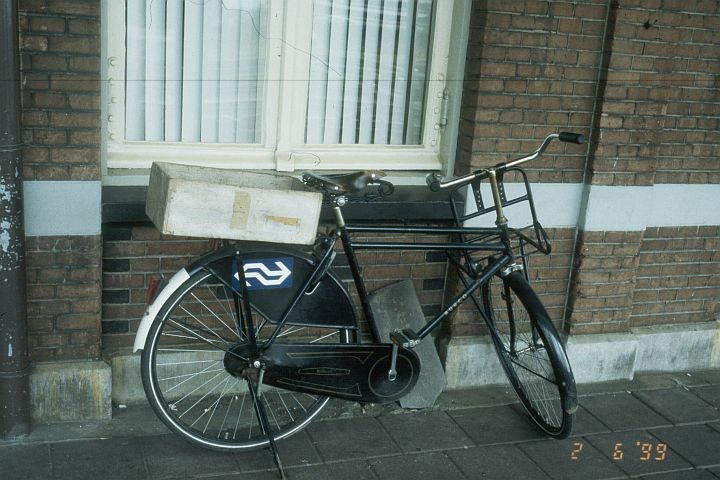 When we went to get the train back to Roermond the above bike was leaning up against the platform our train was due to depart from. Ceri-Siân thought we had to ride it back! For the more energetic there was a quiz ride. 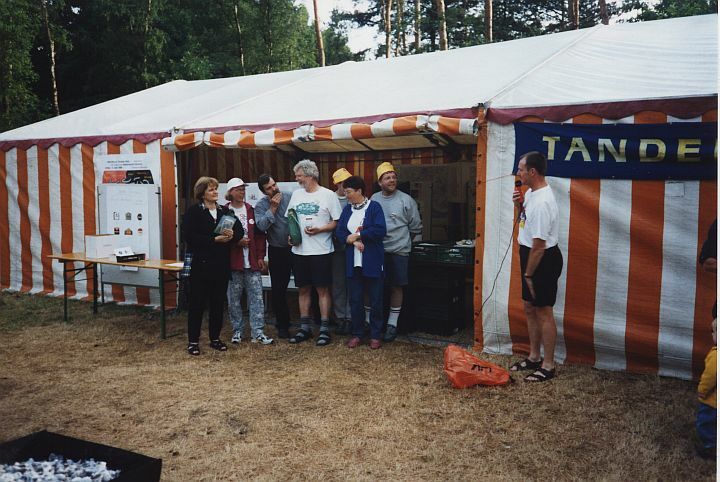 The Wednesday evening was the traditional games evening organised by the Dutch contingent. 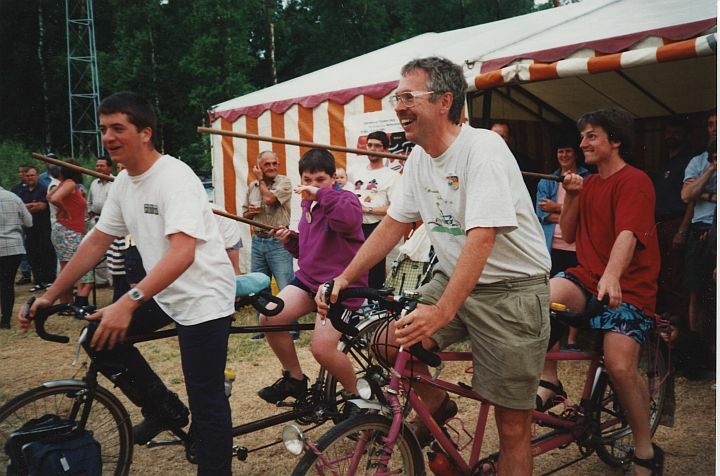 The games include - Tandem jousting, I have Neil Wheadon jousting for me and our worthy opponents were two of the Selby brothers. The games include - Tandem egg and spoon. Here the Carthy family show that a triplet is just as good as a tandem when it comes to the games. 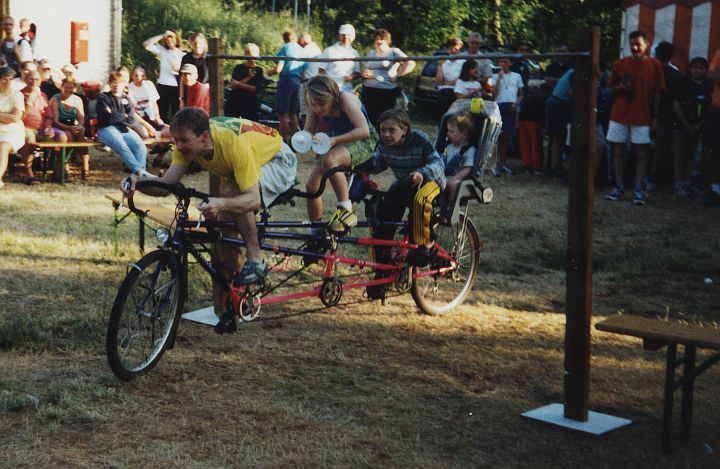 The games include - Tandem limbo, this family take the limbo very seriously and the bar would go a lot lower for them! Thursday's ride. 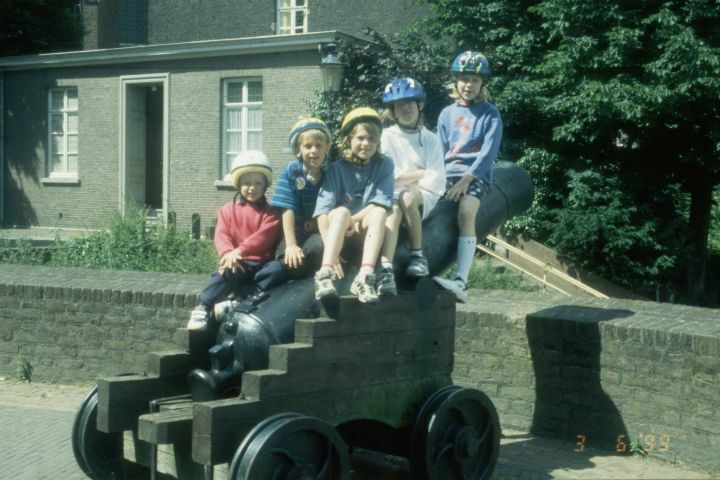 Grote Peel, took us in to Roermond, where the kids posed on a cannon. 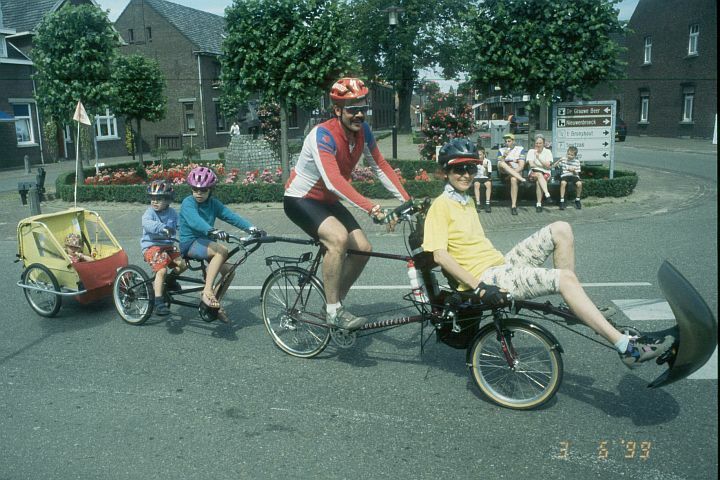 An interesting half recumbent tandem with a long trailing load! Friday's ride was in to Germany, Maas-Nette ride. 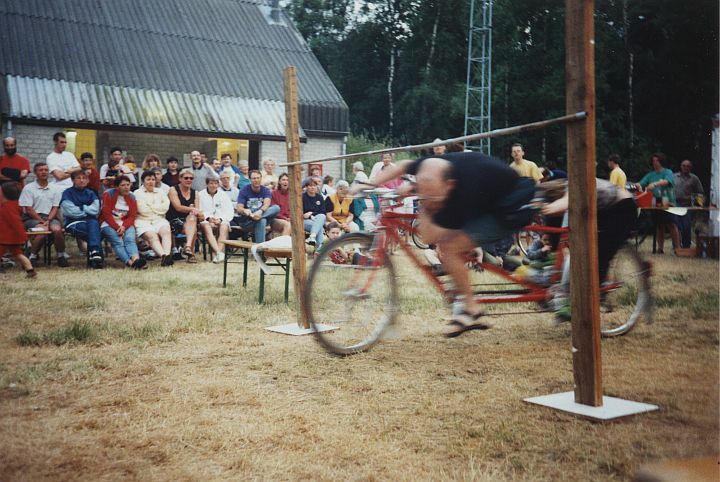 With the International being based in the Limburg region there were numerous cross border rides. 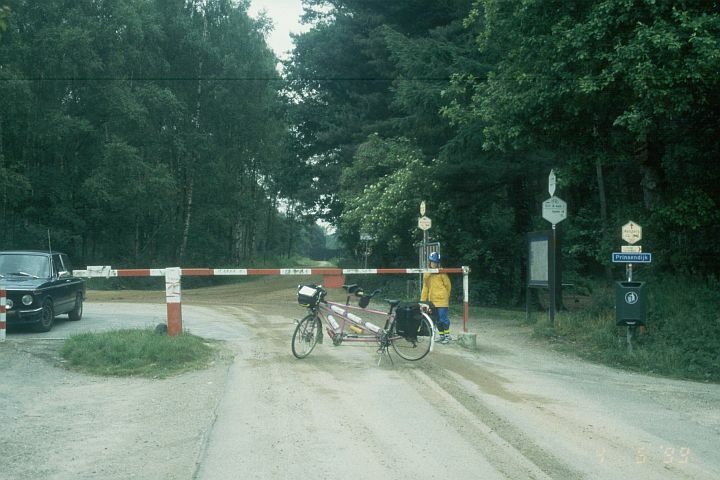 All border crossings we used between the Netherlands and Germany were closed to motor traffic. Don't be fooled by the car parked on tarmac. The German side where the car is was a sandy track. 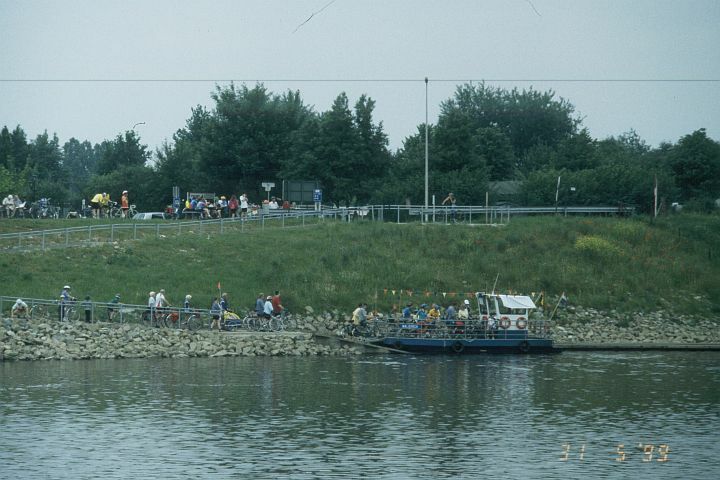 The destination for the short ride was Teir Park Brüggen. 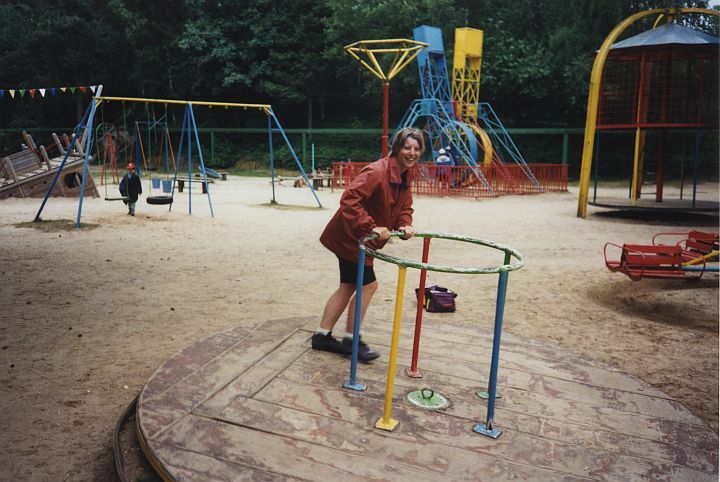 It was more off an adventure playground then animal park. Even the mums found time to play - Maria Carthy taking time our from her brood. All good things come to an end. 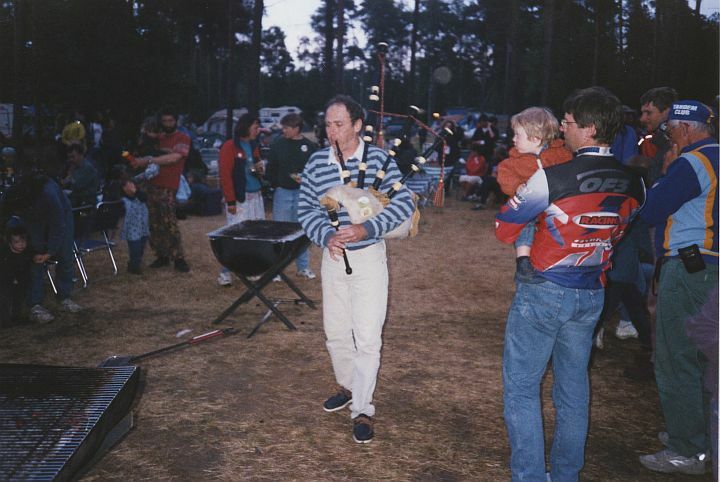 The closing ceremony and barbeque held on the Friday evening. Serge Bruneau playing a lament on the bag pipes for the end of the rally.